If you’re looking for crab, you’ve come to the right place. 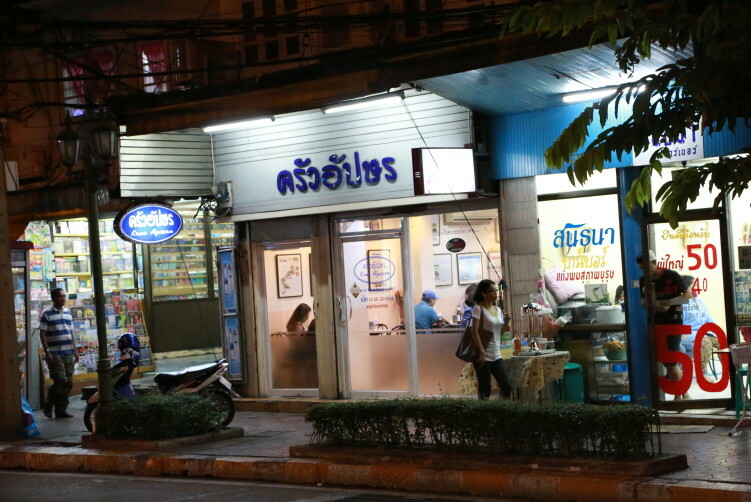 But Krua Apsorn branch on Dinso Road, just south of the Democracy Monument, is more than just crabs. It’s also one of few restaurants that manage to have 40 different dishes on the menu and still come out of the battle with supreme quality. The inside of Krua Apsorns first room. There is a second and bigger room as well. The area between the Sao Ching Cha and the Democracy Monument has one of Bangkok’s highest density of food vendors. 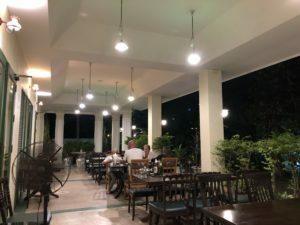 Dinso road that runs between the two points, and the Mahannop road just around the corner, has a good blend of typical shop house style restaurants and plenty of options when it comes to what to have on the plate. It’s also not far from the famous Khao San Road, but far enough to shake of the big masses. At Krua Apsorn you see City Hall office workers joining a few backpackers and other visitors during lunch time and early dinner hours in a dining space that is set between large windows. Most dishes are seafood based and rich in taste. 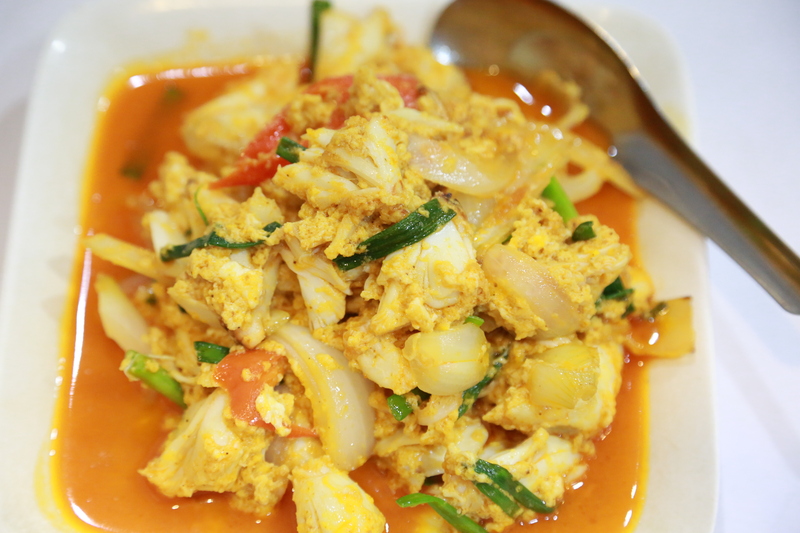 Crab meat mixed with yellow curry and egg, or crab meat mixed with yellow chillies and green beans are house specialties. One of those will set you back around 400 B (crabs are expensive). But yes, it’s worth it. Most dishes are in the area of 100 BHT. I did crab dishes on my first visit, and that was of such a high quality that I decided that I had to come back for some other testings. I was sitting next to a couple traveling for 3 months and they praised the four or five dishes they joined. But of course I can’t just build on recommendations, even when it comes from a nice couple with interests in Thai food. 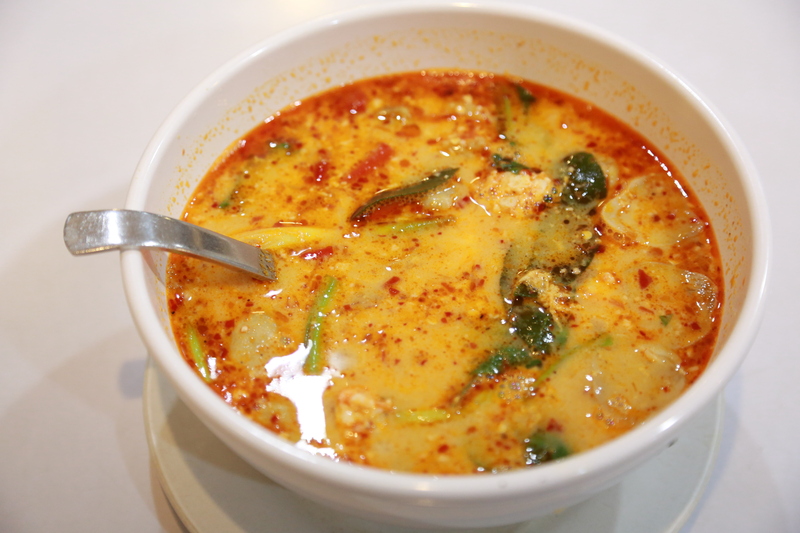 And I’m never able to avoid Thailand’s famous shrimp soup, tom yam kung, when I’m in good hands kitchen wise. And I wasn’t disappointed. It’s a very good dish as well, balanced even if it isn’t very spicy. The shrimps are fresh, crispy and tasty, just as it should be. 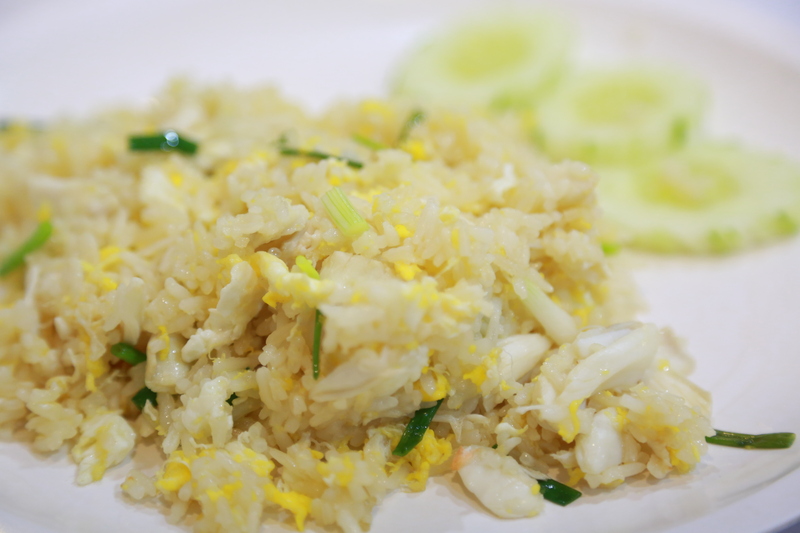 I also decided to test two quite common dishes ordered by visitors to Thailand, so I ordered fried rice with crab and Pad Thai. I always order fried rice with crab when available instead of the plain steamed rice as a side dish to my tom yam kung. And at Krua Apsorn it’s a no brainer, when you know how good they are with crabs. And yes, again, pure delight. fluffy and tasty. A small piece of lime is the only condiment that comes with the dish. And it’s enough. Just what you want and nothing more. 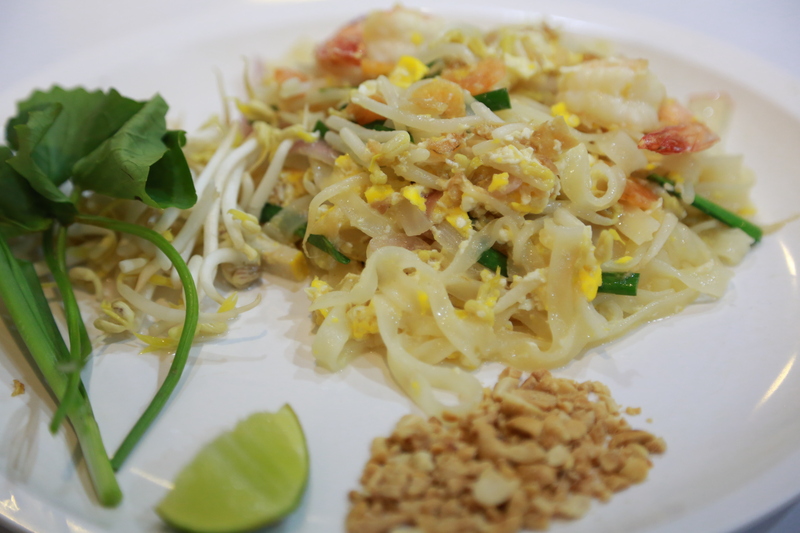 It’s the same for the Pad Thai with tofu and shrimps (Pad Thai Goong). There is no condiments on the table, no chili, no vinegar, no fish sauce. But is it needed? Not really, but a flew flakes of chili would have been preferred. But that’s a matter of habit. It was still a very good Pad Thai, beautifully presented compared to most other places. Their specialty is definetively crabs, but in general they deliver on all dishes tested out. The focus is on comfort food from Central Thailand. Very few people, if any, will struggle with spiciness as most dishes are on the mild side. But of course there are exceptions, like the stir-fried mussels with basil, or the hoi malang pad chaa, that is served with plenty of red chillies, holy basil, wild ginger (krachai), lemongrass and fresh peppercorn. On my earlier visits I have also tested deep fried king mackerel with mango salad and the yellow curry with prawns and lotus shoots. They are both delicious. They also have some pork dishes, but I have not tested any of them. Like most places they don’t separate between appetizers and main courses so it all comes in one go, or when it’s finished in the kitchen. 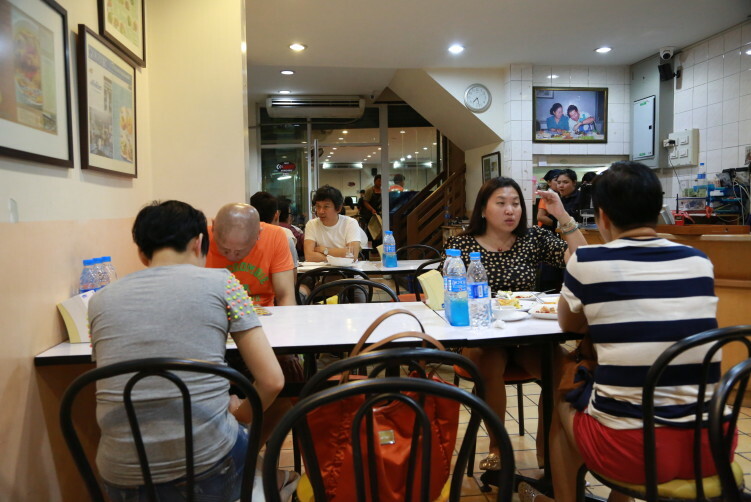 Krua Apsorn have a good atmosphere and is maybe more of a brunch or lunch spot as it closes 8 pm. For dinner guests I would suggest to be there no later than 6:30 as they might run out of some dishes. 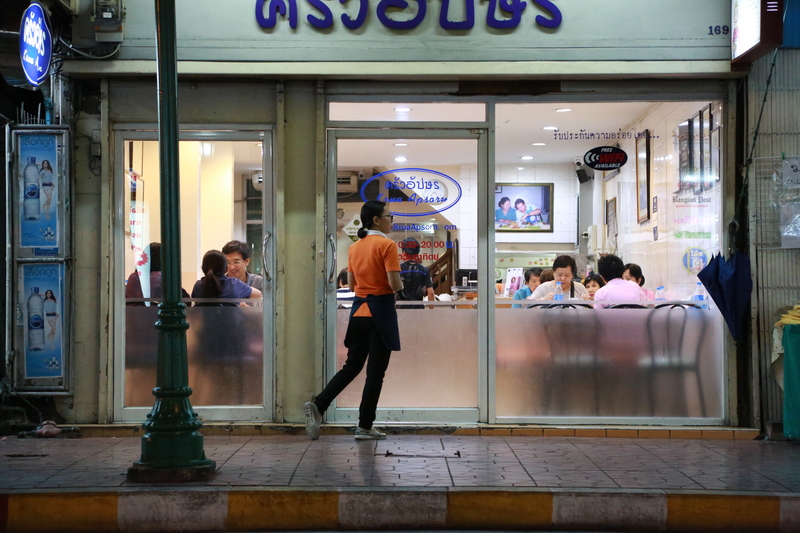 Bangkok has a reputation as a dining city, but when it comes to Thai food, you normally feel like a winner when you choose those vendors that limits their menu to one or two specialities. Krua Apsorn is an exception to that rule, not the only one, but one that’s able to dish up some very good portions that isn’t their unique speciality. In other words, one of those places where it’s nice to be a group to share with for a wider testing. Let me also mention one of my strong recommendations when in the area, Mitr Ko Yuan. They opened their doors in 1966 and have served delicious food ever since. Another place for duck lovers is Tien Song Ped Yang. read more Food: Focus is on food from Central Thailand. Most dishes are mild. buy now Price: Most dishes around B100. Crab specialities just below B400. trusted tablets Open: Mon-Sat 10:30 a.m. – 8 p.m. In other words a lunch or early dinner spot.